Interlocking tiles have achieved popularity among almost every commercial and domestic constructions. It can add an aesthetic attribute to the walkways. Noways, it has become a trend to make the floor more attractive with pavers. Do you wish to enhance your outdoor living and keep more space for you to enjoy the freshness of nice days with sunshine and breeze? A vital part of landscaping project is opting the best building materials that will give the look and long durability you desire. Brick masonry or concrete pavers can assist you to make any landscape to make it look best. They can customize a design as per your need to be as dramatic or as common as you desire. By following some simple steps, paver installation project can be correctly achieved. For every work to get completed, the first stage will be planning. Establish an idea of how large the ground you have to pave the blocks. All other things will be organized according to these criteria. 1. Choose the correct paver – Today, we are availed with a variety of pavers for industrial and domestic constructions. Choose one which suits your perspective of cost and other factors to be considered. Material options: The new trends in paver blocks are associated with the brand, color pattern and quality assured. 2. Prepare your ground for paving – Make sure that your land is ready for paving without any hindrances like tree roots, weeds, and uneven ground. Machines and tools are available to do the same. Positioning the path: Before laying the pavers you should have a correct paying positioning and this will also help in getting proper measurement for making an optimum purchase. 3. Start with laying the base elements – Base materials are to be used in accordance with the paver you are going to use. The ground should be even and solid to start paving. 4. Lay the paver blocks – After laying the base materials, make it perfect with a plank and begin paving. Different patterns are used in paving in accordance with the landscape. Care should be given on the boundary pavers. 5. Final tasks – Make it more attractive and completed with perfect coloring options. You can add some colors in accordance with the surroundings and one which match with the building. Do you know that pavers will last for around 25 years withstanding the environmental changes? So it will be a long term investment and you have to be more careful about the same. Today, the use of paver blocks are significantly increased as it has been widely used from houses to office setups. It has become an essential thing in landscaping idea and urban constructions. Paver blocks are generally used by construction agents or builders in the pavement of parking areas in big to small buildings including domestic and commercial, food courts, and public parks, railways stations, bus stands, the compound area of large shopping malls, driveways in cities and walk areas for pedestrians. They are mostly preferred by almost all innovative builders with outstanding and awesome landscaping ideas since they are available in different designs and styles as per the preference needs of the customers. At JR, what we are doing? At JR industries, we can provide you with paver moulds of rubber, plastic paver moulds and pvc paver moulds. We are making use of these materials for an effective paver production since they have the properties such as durability and long lasting quality in output. And our productions are done in an environment friendly manner that doesn’t harm the surroundings. The plastic we make use of in the production of paver moulds are recycled plastic wastes. This can be helpful in decreasing the wastes. A production that considers every deals in exhibiting the quality is our ultimate proposal. Niger is considered to be one of the safest countries in West Africa. Although Poverty and economic crisis are going on, Niger still managing to show a steady growth from the past. This country is a West African country where 80% of the land area lies in the Sahara desert. Niger is an Islamic predominant country with 21 million population and Niamey city is the national capital. India and Niger share a healthy friendly relation and Niger stand with India in the global disputes whenever it was necessary. Although an Indian President or Prime Minister never visited Niger, India provided economic assistance and technical assistance in various departments. 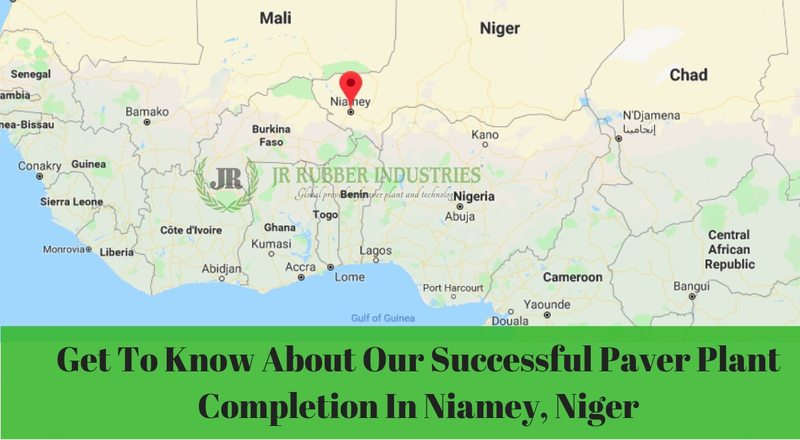 Niger being one of the steady growing African country, JR found the right time to enter the Paver business and building paver plant and paver mould in Niger. JR established Unloading and product stacking at the client site, Niamey, Niger to spread our success story to NIGER. Our client in Niamey procured Rubber moulds , Paver plant, setting chemicals and color Oxides from us and established a successful plant for. With the plant establishment, we also took the initiative to provide a proper training for client operating members on production processes, procedures and complete technical knowledge for a guaranteed smooth operation. 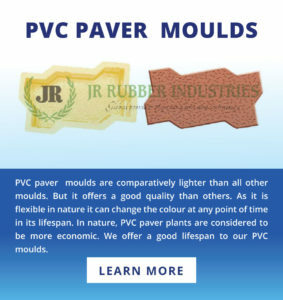 Other than that, we are also pvc paver moulds manufacturers in niger and we have the presence in Lagos, Nigeria, Western Sahara where we completed the plant with machinery and rubber moulds and showed our strong presence in Western Africa. Rubber moulds is a molding process that builds rubber products for various uses. Here in Niamey, Niger, the plant we established produces rubber moulds for our client and these rubber mould are made from uncured rubber or elastomer. The elastomer is any material that transforms into its original form after being pressured or distorted. Rubber is an excellent replacement of elastomer since its ability to come back to original form after being pressured or distorted heavily. 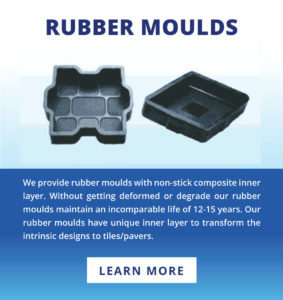 Rubber moulding creates moulded rubbers after being pressed for moulding the rubber. Those moulded rubbers exposed to heat. All the rubber manufacturers use heat and pressure to form moulded rubber products. Here are the detailed description about our different kinds of paver plants. Our Niger plant have a capacity of 400 SQM pavers/ tile in 8 hour shift. Mini Paver is a plant with multitasking specifications used for paver/tile production. It is a high-performance paver plant with the capability of performing a large variety of task in the field. This plant has the capability of 3500-4000 moulds within a normal 8-hour shift and capacity to build various level or pavers with a production. 8mm thick top plate and 3 working table with a machine dimension of 10 Ft length * 2.75 widths * 2.96 Ft height. A 150 km weighted Pan Mixer and have a balancing capacity of the 150kg batch with a total volume of 200-litre capacity. Having a power of 3 horsepower electric motors with a bottom plate of 10mm and 8mm plate at the sideline. A 500 km weighted Hydraulic Muller type Grey Mixer machine. This machine is particularly used for the concrete mixing process with a capacity of 500 kg and 700-litre volume. Feeder hopper has a capacity up to 400 litres which featured with 7.5 horsepower and 750 KG and have a diamond of 55” Dia, 16” depth. Semi paver plant used for the production of tile and paver productions. This machine has a capacity of 9000 to 10000 moulds/8 hour shift and can offer high performance, handle multiple tasks at one time and it provides an option to produce different level of pavers pant. 3 working table with a machine dimension of 10 Ft length * 2.75 widths * 2.96 Ft height. Feeder hopper has a capacity up to 400 litres. Featured with 7.5 horsepower and 750 KG and have a diamond of 55” Dia, 16” depth. The fully automatic machine produces 25000 wet cast paver/day and a great lifesaver for business as it reduces manpower and increases the efficiency. 1st automatic paver creation will prevent the waste of material handling which confirms the right use of resources and duplication. This plant is the most renowned machinery manufacturer in India and introduced for the first time in the world. Below are the features of Fully Automatic Machine. 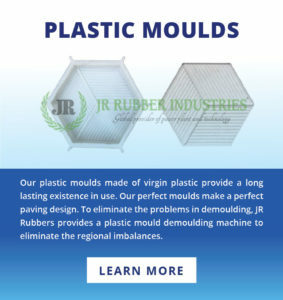 JR Rubber Moulds is a well-known plant and mould builders in all over India also in the middle east and Africa. Having an experience over 25 years in the mould industry JR proved that it is one of the best paver manufacturing company in the world and have strong hold in mould for paver in africa. By providing the quality products and a guaranteed mould lifespan of 12 to 15 years, JR tops its business race in the field of paver creation. Here are a few features that show why JR good at paver mould production. Raw materials like rubber, plastic, glass or metal are given different shapes using a mould, this process is known as moulding. A liquid raw material turns into solid when poured into a mould container. To avoid hasty wear and tear these containers are mainly made up of steel. What is Rubber Paver Moulding? 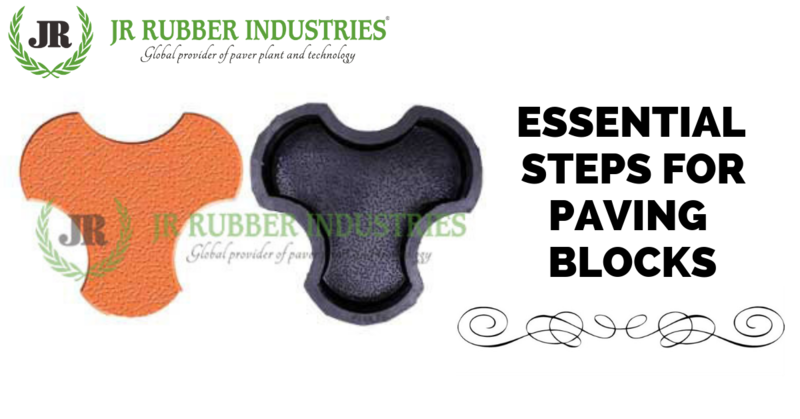 The rubber paver mould manufacturers make a usable rubber product from untreated rubber or elastomers. On applying pressure on elastomers, they will return to their original shape because they are natural polymers bearing all elastic properties. Not only because of its malleability but also because of its varied utilities in industrial and domestic sectors they are broadly used by rubber paver mould manufacturers in India. How to select rubber material? Be aware with the main function of the part .i.e, whether it will transmit or absorb energy. Check the material cost per part. Choose according to the location i.e, inside or outside. Select the place according to match its temperature requirements. Do not expose it to chemicals. Be aware of its physical properties and ensure its regulatory requirements. What are the different types of rubber moulding? Rubber moulds for paver tiles can be done in two different forms of moulding, one is injection moulding and the other is compression moulding. Under high pressure heated rubber compound or material is injected into the mould cavity, this process is known as injection rubber moulding. The molten state material is placed inside the injection barrel. For creating rubber paver moulds in Indonesia injection moulding is the most well-versed way. Injection moulding process.1) Into the injection barrel, an unseasonal rubber material in the form of a constant strip is ingested.2) In a temperature controlled barrel it is warmed by an auger screw. Once the rubber material accumulates the auger screw is pulled backward.3) By an injection press, the rubber material is inoculated into the mold cavities once the auger screw moves backward. 4) When the mold is closed under high pressure the auger screw is pushed forward forcing the material into the mold cavities. 5) When the material is cured in the heated mould the auger screw turns again to replace the injection barrel and the injection part is ready for next shot once the mould gets opened. Rubber paver mould manufacturers in Bangalore place rubber material in the mould and close it under hydraulic pressure. Once the mould opens, you can remove the part from it or else you can trim the excess rubber from its part. Medium hardness compounds mainly make use of compression moulding. This process reduces the flash produced in rubber moulding process. As each and every process of moulding has its own advantages and disadvantages, it is most important to look into all requirements of the product while choosing suitable production. 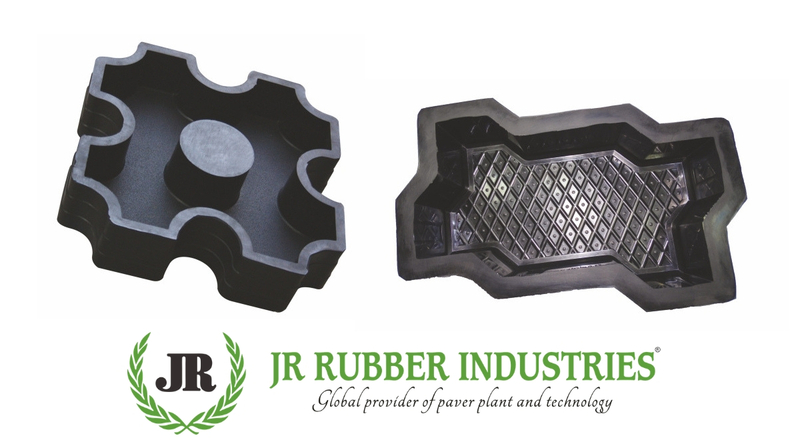 JR Rubber industries serve the finest quality rubber paver moulds for cover block, interlocking, paver tiles and so on as per the satisfaction of customers. We are the extraordinary suppliers of rubber products for years with an infinite number of collections. We also offer rubber moulds in its customized forms as per the requirements of our clients. We are always outfitted with a bulk and cost-effective range of products to provide our customers with an all-time service.